Back in the fall when I was looking for more ways to use up the overload of squash from my CSA, I started baking with it. Using an old recipe of my mom’s for Pumpkin Apple Streusel muffins as a base, I thought I would swap the pumpkin for squash. But why stop there? So I started subbing ingredients to see how I could sneak in more veggies and make the muffins healthier. Some carrots here, some flax seeds there, some raisins for even more texture. 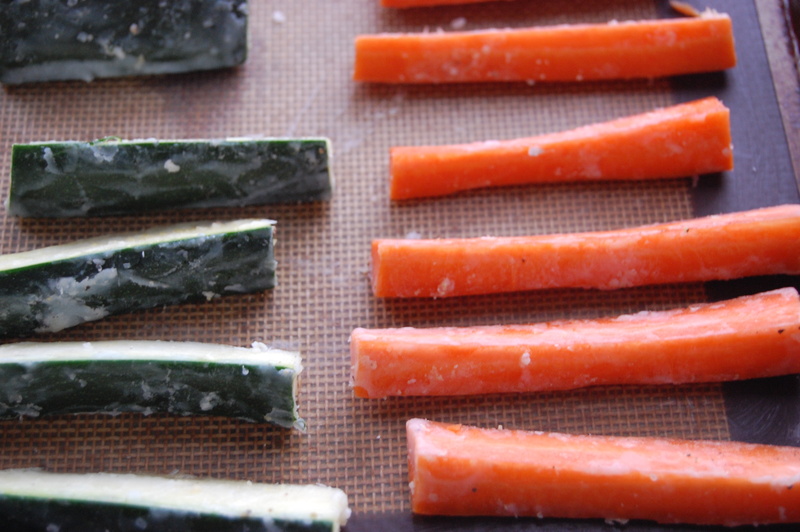 Every time I made them my 2 1/2 year old, who can be hit-or-miss on squash and carrots, gobbled them up. This weekend, he told me he wanted to make muffins so I took on the final frontier – reducing the amount of refined sugar. In my first attempt at messing with a staple baking ingredient, I cut the original amount of sugar in half and replaced the other cup with unsweetened applesauce and added an extra 1/2 C of flour to balance out the extra moisture. Results? Success. The texture was exactly the same as the original version and although the muffins themselves are less sweet, I actually prefer it that way. Plus, it still passed the toddler test of requesting seconds. Preheat oven to 350. In a large mixing bowl, beat together oil, eggs and pureed squash until combined. Beat in sugar and applesauce. Beat in pumpkin pie spice, baking soda, salt and flax seeds. Add flour, one cup at a time, mixing well for even texture. 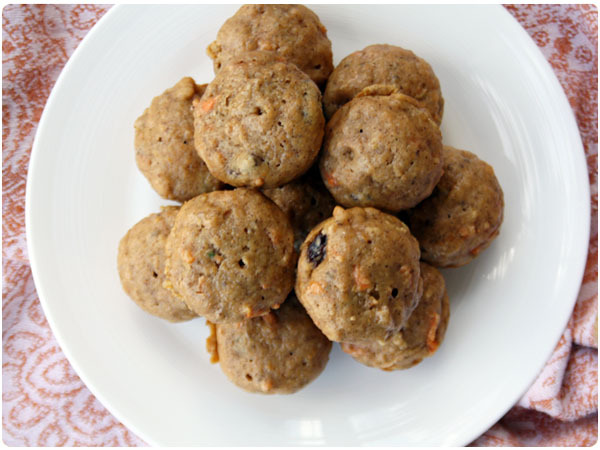 Fold in carrots, apples and raisins. Lightly spray mini muffin baking tin with cooking spray. Spoon batter into baking tin so that each cup is 3/4 or slightly more full of batter. Bake for 12 minutes or until toothpick comes clean. I’ve been Valentine’s nostalgic this year after signing up to bring the sweet treat for my little guy’s Valentine’s Day party at school. Nothing says Valentine’s Day more than Conversation Hearts. While these little heart-shaped sugar messages have evolved over the years – TXT ME, TWEET ME – the taste still brings back memories of stuffing little homemade mailboxes full of loving messages and treats. I knew these three and four-year-olds would be hopped up on lots of sugary treats, so I wanted to make a bite sized treat to share. 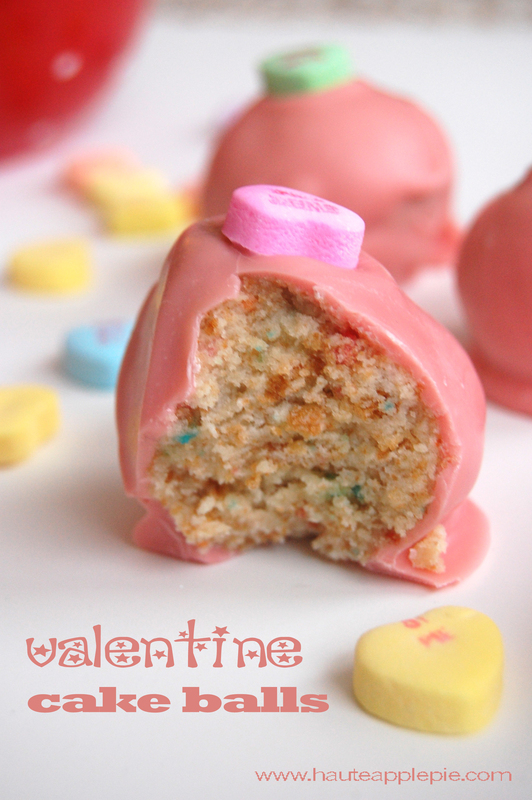 I put together these funfetti conversation heart cake balls that are as tasty as they are cute! Bake cake mix according to directions on box. Allow to cool. In a large mixing bowl, crumble cake. Add frosting and mush cake and frosting together with hands, working frosting through cake to mold together. 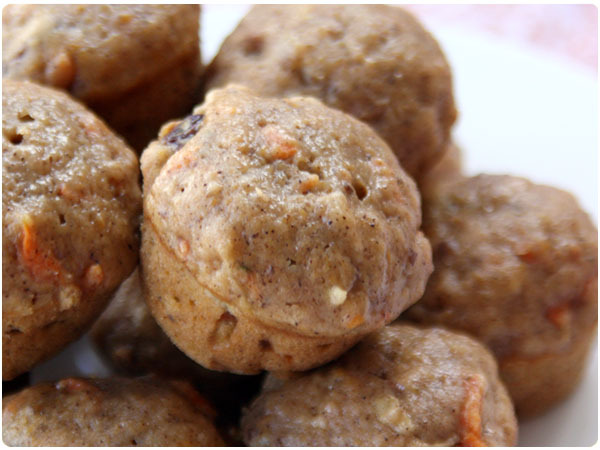 Using a tablespoon or cookie dough scoop, scoop out 1-2 inch balls of dough and roll. 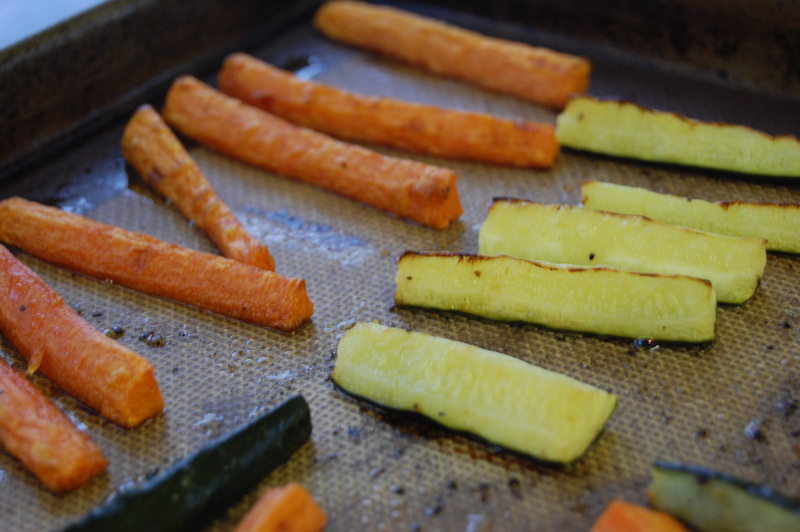 Place onto foil lined baking sheet. Continue until all dough is used up. Refrigerate for at least one hour. In microwave, melt candy melts according to directions. Using a teaspoon, drop balls, one at a time into candy melt mix. Full coat and slowly drop balls back onto foil lined sheet. 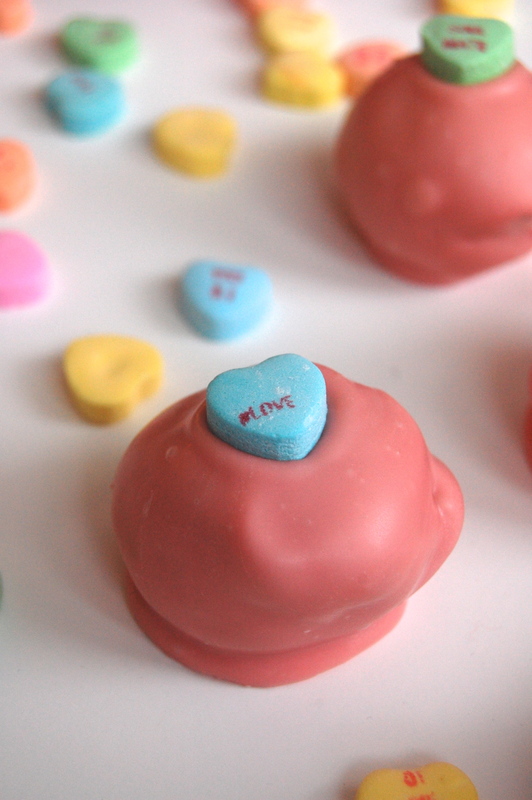 Place one conversation heart on the top of each ball, pressing in. Put in a cool place to dry, at least one hour. Cover for up to one week or freeze for three months. Looking for another comforting Valentine dessert? Try any of these from our friend’s around the web! 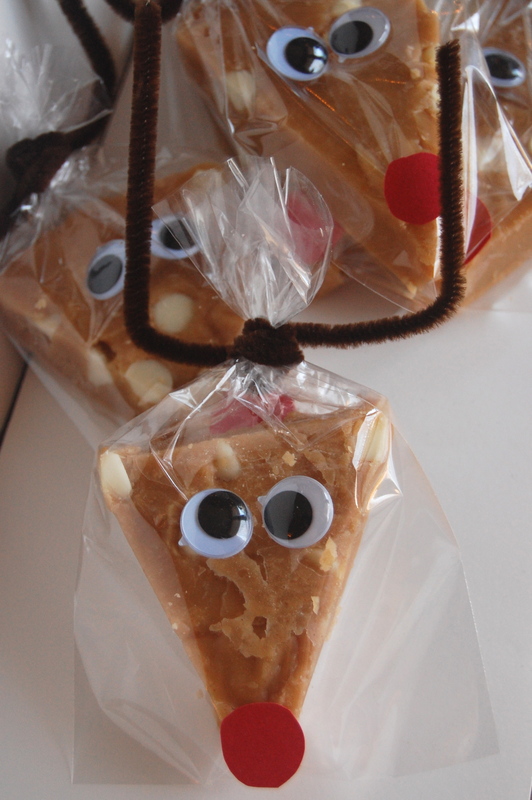 If you are looking for an easy treat to get crafty with this Christmas, try this simple white chocolate peanut butter fudge recipe and wrap it in Rudolph! 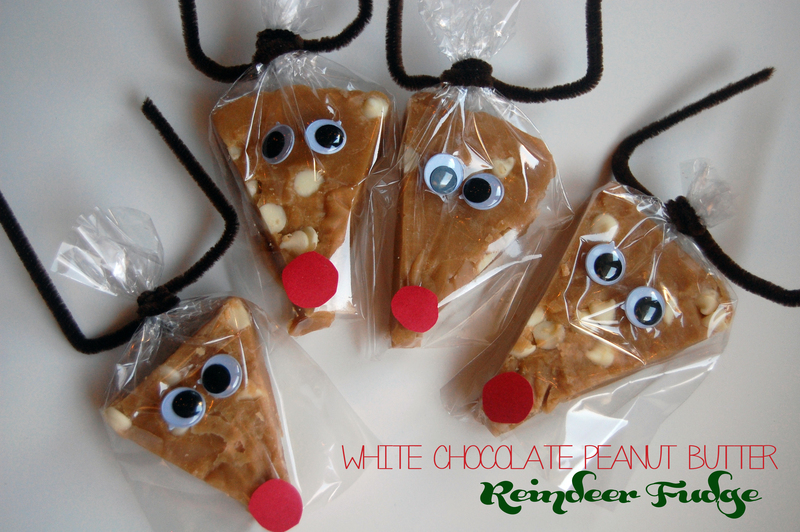 I have a small obsession for Rudolph crafts and treats as seen in my posts of Christmas’ past: Rudolph the Reindeer Treat Bags and Reindeer Peanut Butter Cookies. This year, we were asked to bring something to a cookie exchange for a kid’s holiday party and I thought these would be the perfect addition. They take about ten minutes of prep and cooking, 2 hours of cooling and a little extra time for decorating (which can be done with or without a little one). Line a 9 inch glass pie pan with non-stick foil or wax paper. Spray with cooking spray. Set aside. In a medium saucepan, whisk together sugar and milk. Heat and whisk until dissolved. Bring to a boil and allow to boil for 2-3 minutes, or until mixture becomes thickened. Remove from heat and stir in peanut butter and vanilla until incorporated. 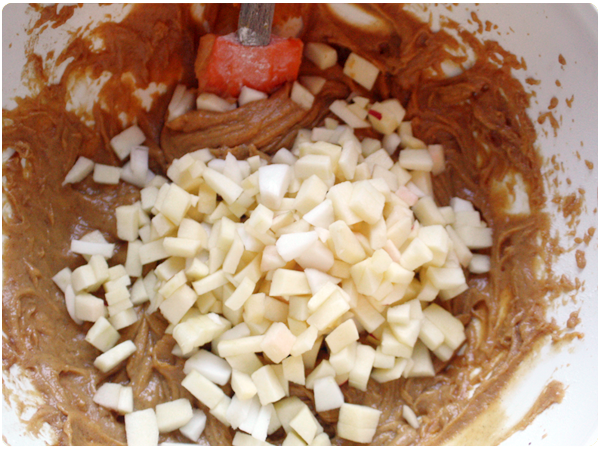 Using a rubber spatula, spread mixture into pie pan. Sprinkle white chocolate chips generously over the top, patting down with the spatula. Cover with plastic wrap and refrigerate for two hours. When chilled, remove foil from pie pan and cut into triangles. One pie pan will make approximately 10-12 triangles, depending on the size. Place triangle fudge into bags. Fit bag tightly over fudge and pull together at the top. Secure with pipe cleaner, twisting to create a seal (you could always place a small rubber band to secure the bag first if you’d like). Fashion pipe cleaners into antlers, bending to your liking. Cut small circle with construction paper. Glue at tip of bag. Stick eyes above. Repeat until complete. You can also use your favorite brownie or blondie recipe with this wrapping to create the same effect. With the holidays just around the corner, I’m still hanging onto the last little bits of fall. Let’s face it, as soon as it slips away it’s going to be awhile before us cold climate people see signs of outdoor life again without freezing our fingers off. 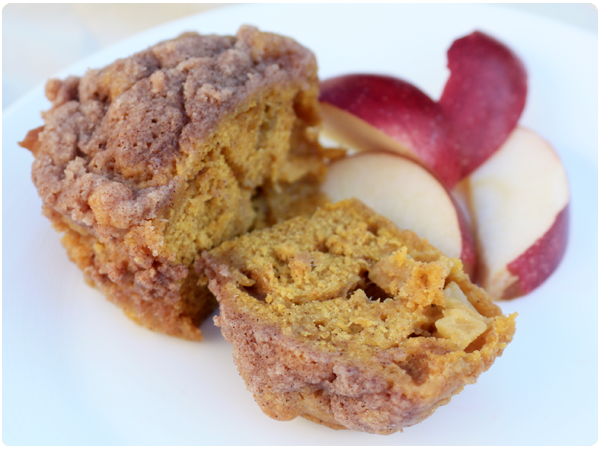 As an homage to all the best fall flavors, I’m sharing these Pumpkin Apple Streusel muffins that my mom used to make for us as kids. Consider them tasty little bites of autumn that you can bust out when the winter blues set in…or just for every weekend prior. Preheat over to 350. In a large bowl, combine eggs, pumpkin and oil. Beat in dry ingredients, working in flour and sugar one cup at a time. Stir until batter is fully mixed. 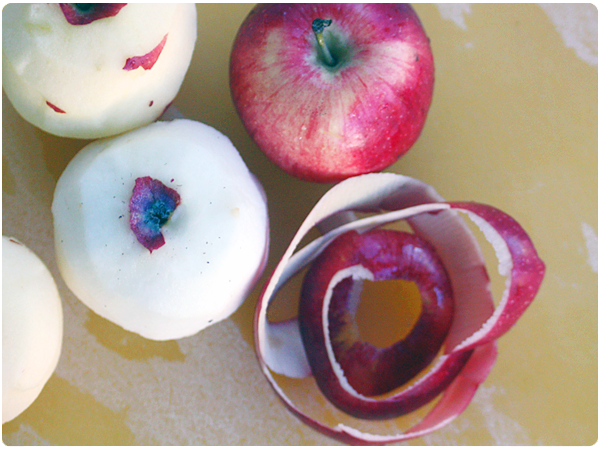 Using a spatula, fold in apples. Spoon batter into paper lined muffin cups, filling about 3/4 full. In a small bowl, combine flour, sugar and cinnamon. Cut in butter until mixture is crumbly. Sprinkle on top of batter in each muffin cup. Bake for 25-30 minutes. It is no secret that I love to bake muffins. Who doesn’t love a fresh warm muffin with their morning coffee? 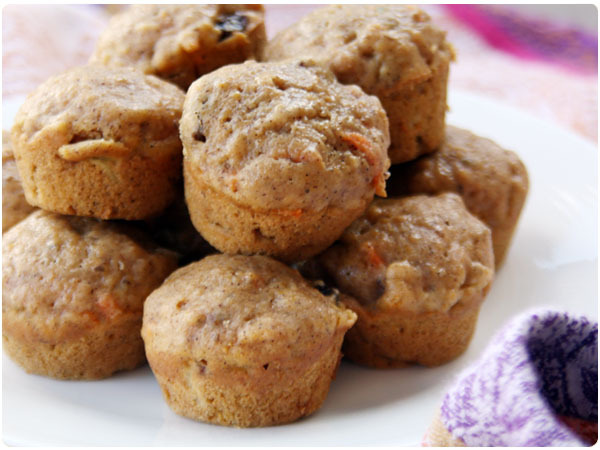 Adding veggies to muffins is a great way to get those required veggies into your diet (or your toddler). I decided to mix it up this time and make it an inside out piece of carrot cake. 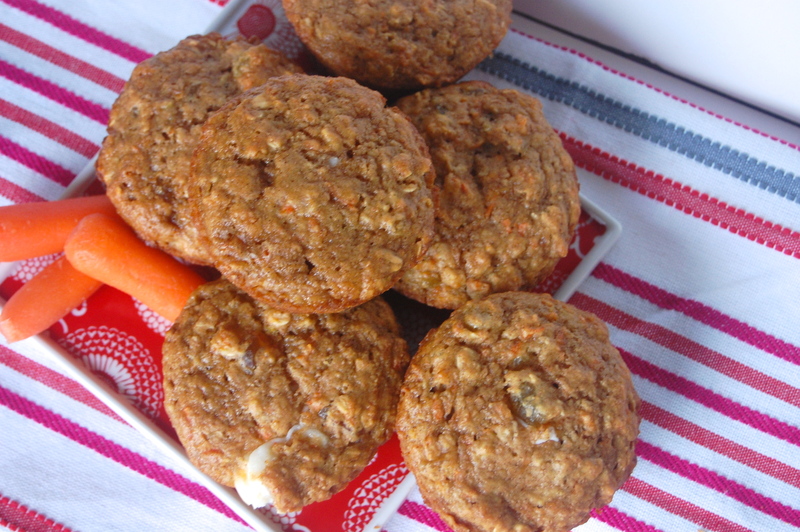 It is a lightened up recipe, using a mixture of whole wheat and all-purpose flour, golden raisins, oats, carrots, yogurt and applesauce. 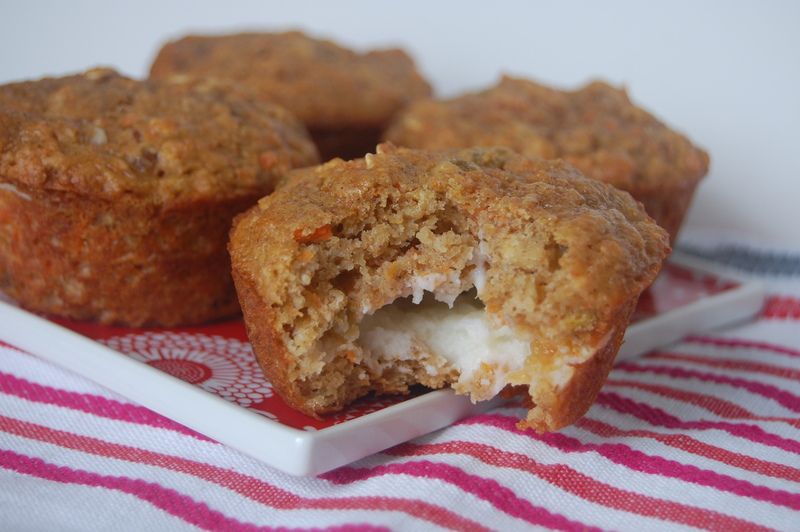 Using substitutes like applesauce and yogurt creates gives the muffins a nice, sweetened taste and moist texture. However, the consistency of these muffins will be a little chewier than a fluffy oil, flour and butter muffin. These muffins would be just fine without the frosting middle, but for a little extra fun and a tiny bit of effort (and calories) it is well worth it! Mix flour, brown sugar, baking powder, salt, baking soda and cinnamon in a large mixing bowl. Add oats and raisins until combined. Set aside. With an electric mixer, whisk eggs, applesauce, yogurt and vanilla. By hand, add carrots and lemon zest. Mix until combined. Fold wet mixture into dry mixture until just combined. With an electric mixer, beat cream cheese and powdered sugar until fluffy. In a greased muffin pan, add one tablespoon of batter to each cup. Top with about one teaspoon of cream cheese frosting. Top with another tablespoon of batter. You will likely have a little bit of frosting left over. Bake in oven for 30 minutes, turning pan half way through. Remove from oven and cool slightly on cooling rack. Go ahead and sneak one right out of the oven, they are delicious warm! Enjoy some more sweet and savory carrot recipes from these fabulous bloggers as part of Food Network’s Fall Fest! I often find myself eating breakfast on the run which usually results in me downing a granola bar, a handful of cereal or some kind of cookie. Great way to start the day, huh? I needed a better option so I started to experiment with smoothies after my inlaws so generously gave us a vitamix. This thing is amazing and makes some of the best smoothies because it literally pulverizes anything you put inside. 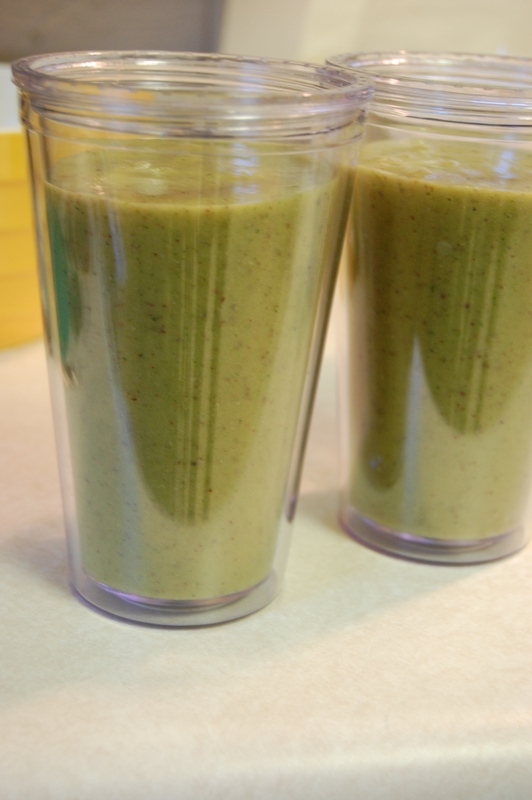 We have tried a ton of different combinations, but this green smoothie is, by far, my favorite. The best part is that the spinach and carrots are almost undetectable and you would never know by the taste that they are even in there. My husband and my daughter drink this without hesitation. I love it because I can start my day off with a good dose of fruits and veggies and it is incredibly filling. 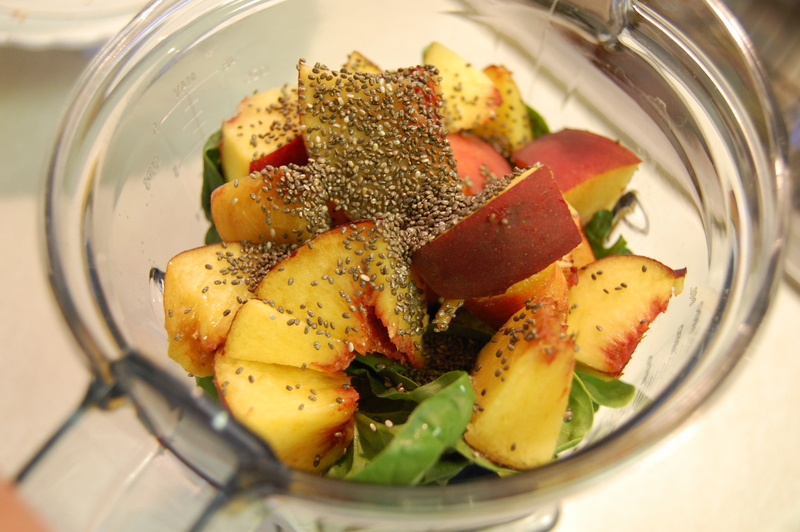 Place the ingredients in your blender and blend until combined. Add ice if you like your smoothies chilled. We pour ours into to-go cups with straws so they are the perfect breakfast on the go! I had mentioned before that we used a vitamix for this smoothie. It is an incredibly powerful blender that pulverizes anything you put inside. That is why the carrots are undetectable. If you are using a blender that is not as powerful, you might want to leave the carrots out. I also feel the need to mention that this post was not paid for by vitamix. I just really love my blender!